Follow the A703 from Edinburgh, on entry to Peebles turn right at roundabout and proceed along High Street towards the Parish Church. We are on the left hand side of the street Between the Royal Bank of Scotland and The Keg. Follow the A68 from Jedburgh, head for Galashiels then follow the signs for Peebles. On entry to Peebles take first left turn at the roundabout along Peebles High Street. Upon reaching the market cross; We are on the left hand side between the Royal Bank of Scotland and The Keg. Take the A702 to Blyth Bridge then the A72 to Peebles. On entering the town proceed down Old Town and when approaching the mini roundabout turn left down the High Street. Upon reaching the market cross; We are on the right hand side between the Royal Bank of Scotland and The Keg. 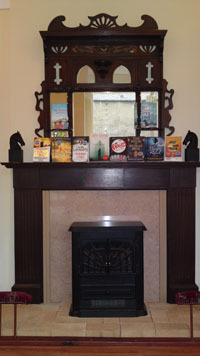 We are also very happy to host book launches & book readings, knitting or craft evenings. 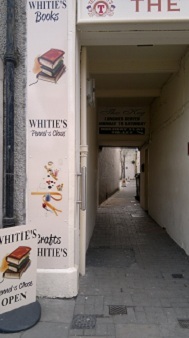 Situated at the joint of the High St. and the Eastgate in Pennel's Close; which is behind the Royal Bank of Scotland. On Proceeding through the passage between the RBS and The Keg you enter into an attractive courtyard and we are situated on the right-hand side. With our large windows we have a very light and airy space with lots of room for wheelchairs and buggies.